The Queen's Warehouse was constructed in 1889-90 to the design of Victorian Public Works Architect AJ Macdonald. The foundations were laid by Turnbull Bros and the superstructure was built by James H C Sutherland. It is a two storey, brick, arcaded warehouse. The building is supported on timber pilings and bearers on which the brick strip foundations are laid. Each bay of the building features an inverted relieving arch. A concrete and timber upper floor is supported on corrugated iron jack arches and cast iron columns. The warehouse was initially built as a Customs bonded store for seized goods and as such was transferred to the Commonwealth in 1901. Between 1908 and 1924 it was Australia's first postage stamp and bank note printing works. In 1995 the Commonwealth agreed to hand over the building to the State of Victoria for a nominal sum to become the home of a historic car museum. The Queen's Warehouse is of architectural and historical significance to the State of Victoria. The Queen's Warehouse is of architectural significance as an essentially intact and finely executed major work of the important Public Works Department architect, A J Macdonald who produced many innovative designs for Public buildings and was chosen by Walter Burley Griffin as his assistant in 1913-1914. It is an early example of the unadorned, brick arcaded warehouses that dominated this building type over the subsequent three decades. It is also architecturally significant for its unusual substructure: the large brick warehouse sits on timber pilings and bearers, a response to a difficult and formerly swampy site. 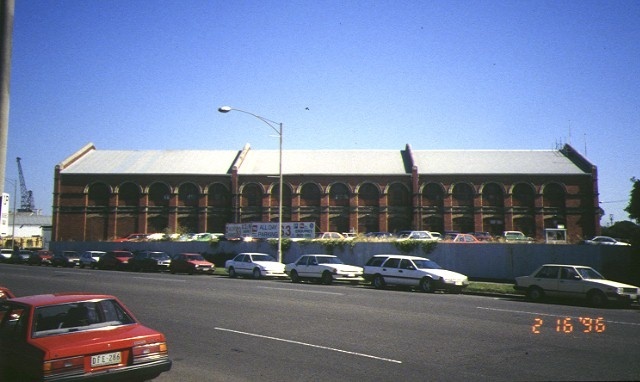 The Queen's Warehouse is of historical significance for its century-long involvement with the customs services of Victoria and the Commonwealth. Its siting between the river, the Spencer Street rail yards and Victoria Dock is indicative of this important function. The warehouse's substantial size reflects the growth of the port of Melbourne at the end of the 19th century, when Melbourne was a prosperous and expanding colony. The Queen's Warehouse is of historical significance as the place where, in 1913, the first Australian bank notes and the first of the Kangaroo series of stamps were printed. The Queen's Warehouse is of historical significance as a major warehouse facility supporting Australia's involvement in WW2 and the post-war occupation of Japan. Under the Department of Supply and Development, the warehouse performed the vital role of the goods distribution point for wharf and rail during the war. From 1946 to 1951 it served as the canteen store for the British Commonwealth Occupation Force in Japan, the supply of which force was conducted out of Australia. As Executive Director for the purpose of the Heritage Act 1995, I give notice under section 46 that the Victorian Heritage Register is amended by modifying Heritage Register Number H1211 in the category described as Heritage Place. 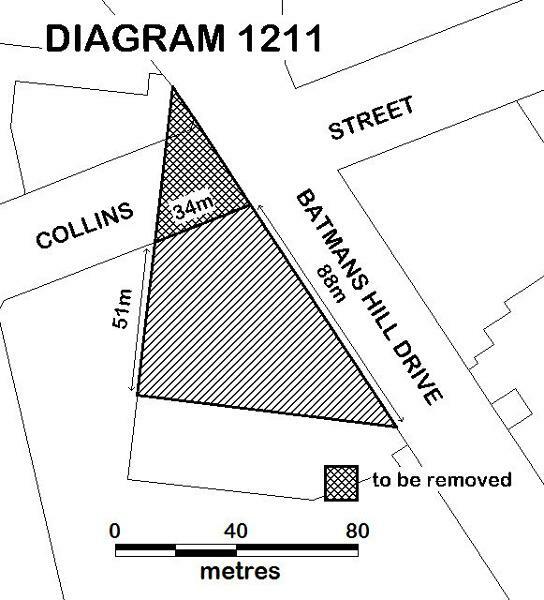 All of the place shown hatched on Diagram 1211 (less the portion shown cross-hatched) encompassing part of Crown Allotment 2014 City of Melbourne, Parish of Melbourne North. The Queens Warehouse was constructed at a time when major changes were being implemented to the Port of Melbourne. In 1887 the Coode Canal, straightening and widening the Yarra, was started. Victoria Dock, which gave the port a much larger capacity than the old wharves around the Turning Basin and Customs House, was completed in 1893. The Queens warehouse was necessary to provide increased customs bond store capacity at this time of burgeoning port usage. The site on which the Warehouse now stands has been shared by several other buildings over the years. The first structure built there was an orderly room for the Melbourne Harbour Trust Artillery Garrison, built on the northern portion of the site in 1886. It remained there until 1912 when it was moved to Coventry Street, South Melbourne and later demolished. 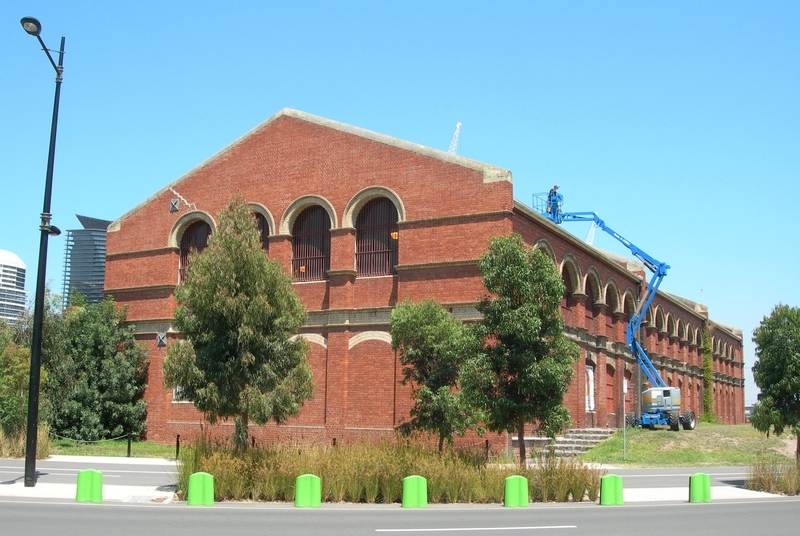 Part of the drill hall site was excised in 1927 for the connection between Flinders Street and Footscray Road and the remainder was used as an asphalt works. The Queens Warehouse was erected in 1890. Turnbull Bros won the contract for the foundations and James H. Sutherland that for the superstructure. The warehouse was used for the storage of seized, detained, confidential and bonded goods until 1908 when it was taken over by the Department of the Treasury for the Commonwealth Stamp Printer. At this time the Warehouse became known as the King's Warehouse. The production of postage stamps became a Commonwealth responsibility in 1901, although the colonies continued to issue their own stamps until 1913. The first of the Kangaroo Series was printed at this warehouse in 1913. When it was announced in 1912 that the Commonwealth was to print its own bank notes, the entire warehouse was turned over to the Commonwealth Note Printer and in 1913 Australia's first bank notes were printed there. Ultimately considered unsuitable for note printing, the building reverted to the control of the Customs Department in 1924. During WW2 the warehouse became a defence store, under the Department of Supply and Development, functioning as the wharf and rail distribution point for goods in Melbourne. In 1946, the Queens Warehouse served as the Canteen Store for the British Commonwealth Occupation Force in Japan, returning to Customs use in 1955. The warehouse is now a car museum. Report prepared by Australian Construction Services in November 1994.